I have been struggling with the combination of allergy, spring cold and sinus infection all through March. When I am suffering like this, I crave simple and comforting soups. One of my favorite soups to make at times like this is Caldo Verde, a Portuguese national soup typically consumed during Portuguese celebrations, such as weddings. It is sometimes consumed before a main course meal or as a late supper. The beauty of this soup is the simplicity of its ingredients and the process, which is particularly helpful when you are not feeling well. Even with just three main ingredients (potato, kale & onion), this soup packs clean, comforting flavors. If you must, you can add chouriço, the Portuguese version of chorizo in the soup to add depth and smokiness. In a large pot, heat the olive oil over medium heat. Add the onions and cook until they are translucent. Add the garlic and half the chorizo (if using) and cook about 2-3 minutes. Add the potatoes, stir around, cover everything with the water, bring to a boil and lower the heat, simmering until the potatoes are almost done, about 15 minutes. Off the heat, purée the soup with a hand blender until about half the potatoes are puréed for both chunky and smooth texture. Add kale, bring everything back to a boil and simmer until kale is soft. Season with salt and pepper, ladle into bowls, and garnish with the remaining cubes of chorizo (that has been browned, if you prefer crispy texture). *If you can find Portuguese chouriço, that would be even better. For this particular dish, I actually used uncooked spicy chorizo sausage, which also worked very well with the flavor. 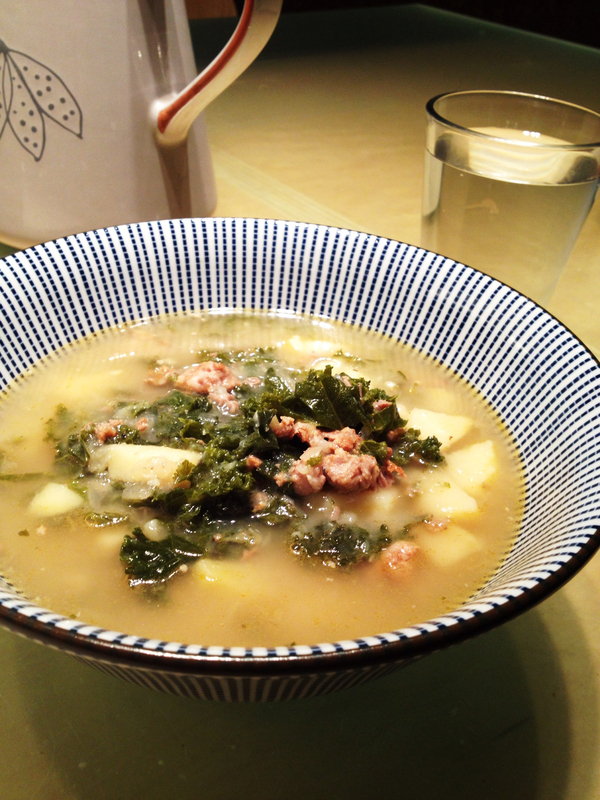 This entry was posted in Recipes and tagged Kale, Portuguese, potato, sausage, soup. Bookmark the permalink.